Weather is dynamic, and the Weather For Sailors CD-Rom puts weather in motion. You'll see how global, regional, and local weather phenomena interact to create the local sailing wind. You'll understand how and why an approaching front will shift local winds, and what to expect as it passes. You'll see how weather differs in different positions around a system. You'll watch as regional gradient weather battles local events for control of surface winds. You?ll marvel at how you can see into the future (that's a forecast!) when you understand the dynamics of weather in three dimensions! It's all there on the Weather For Sailors CD-Rom, plus a voice over by Bill Biewenga. 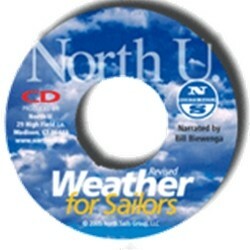 If you can't attend the Weather For Sailors Seminar, get the CD! Windows and Mac compatible. This edition of the Weather CD IS NOT Lion compatible.